Happee Sy of Pulp Live has released the seat plan and ticket prices for Super Junior's Super Show 5 concert in Manila. 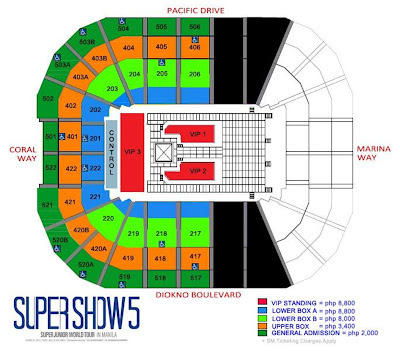 Super Show 5 will be held for 3 to 3.5 hours starting at 7PM on Oct. 24 at the Mall of Asia Arena. Tickets will go on sale starting on Sept. 6, 2013, Friday. Show starts EXACTLY 7 PM! Show Duration: 3 - 3.5 hours! of Super Junior Experience! AND Yes, BDO will once again be offering 0% Installment Plan. Wait for further announcement on how many months. EPlus is like a debit card which you can use within SM Malls, to buy Official Merch on the concert day or food or drinks or anything! For SuperShow 5, we are releasing a Special EPlus Card for ALL TICKET HOLDERS (Mechanics to be posted soon) then, you can use that EPlus card to buy your stuff for SS5! Whats so Special with EPlus Card? 1. Obviously, there's the photo of the boys.. of course, thats the ultimate perk there. 2. You get REBATES! in CASH! So basically, you will get part of the cash you paid for your ticket to SS5 credited inside your EPlus Card! Isn't that cool? Of course, the more expensive your ticket is, the higher the rebate is. Then with that amount credited to your EPlus Card, you can now use that money to buy your Official merchandise, hotdog, softdrinks, whatever you want in SM! Go to the SS5 Manila event on Facebook. Click here. Are you excited? Let me know by posting your comments below.